These benefits should be compared to those offered by the Dawnguard. 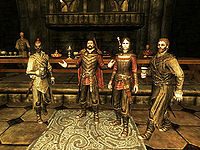 Free access to Volkihar Keep, which holds several wardrobes and bookcases that are safe containers for storage, as well as mortal thralls for safer feeding. 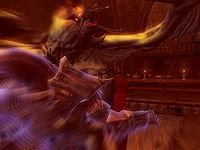 The ability to transform into a Vampire Lord upon immediate membership (can be obtained later if you side with the Dawnguard). The Bloodstone Chalice, Amulets of Night Power, and Rings of Blood Magic, which can augment your vampiric powers. CuSith and Garmr, two death hound followers. Attacking a member of the clan will make all clan members (except Serana) turn hostile to you. Sheathe your weapon or unequip your magic and they will forgive you this time. If you attack them again, they won't calm down easily. Valerica's Journal by Valerica — Valerica's notes on attuning the portal vessel to the Soul Cairn.